﻿Legrand Legacy: Tale of the Fatebounds [Another Indie] – Ouch That Hertz! The past several years have seen a lot of developers, indie and AAA, bringing new games that are reminiscent of classic JRPGs. Some have succeeded, but a lot have failed as they stuck too close to the dated formula instead of providing better quality of life elements or a bit of progression that still rings true to the classic experiences. This is where the Semisoft-developed Legrand Legacy: Tale of the Fatebounds comes in. The developer described this game as a “nostalgic love letter to classic JRPGs,” but at this point is that even a good selling point? Lucky for you, I am here to tell you what to expect from this game; unluckily for me, I am here to tell you what to expect from this game. See, this game was released on PC early last year before seeing a release recently on the Nintendo Switch, and yet this game looks like it was released during the early part of the last generation…if not earlier. (Though I guess the player could say they are staying true with their love letter!) The graphics are dated, and the textures are left feeling flat, while having the disservice of not having any of the charm that could make them endearing, like the recent trend of retro games. While this IS an indie game that was crowdfunded, this is just depressing as the cutscenes shows such promise as to what the developers COULD have done with general gameplay graphics. Then, there is the fact that the markers showing where to enter other areas of the world are sometimes hard to see due to their small size and the color being close to the world’s color palette. 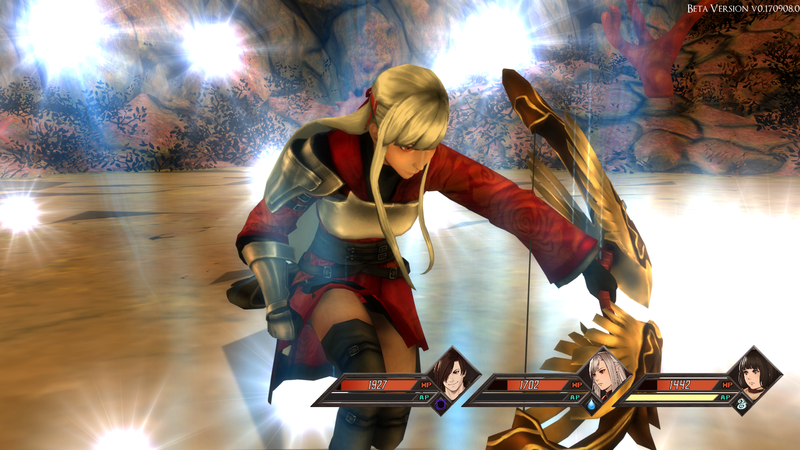 As far as gameplay is concerned, the combat system is based around the “ACT” (Action Circle Tempo) system as its default system. Essentially, it turns each combat move into a Quick Time Event with the player having to time the button press just right. If they do, they get attack bonuses- note that being a bit off gives neither penalties nor bonuses. It is when the player misses completely that there are penalties. However, the developers made the design choice that once the ACT system begins it will not continually go around. Therefore, the player must be paying attention and be quick on the right button or get screwed over. Now, I am not advocating for an endless spin, but they could have given more leniency, or let the player initiate the spin so they are more prepared. While this is different from traditional JRPGs, it is a much worse system. Thankfully, they include the option to go to a more generic experience that gives less EXP. Story wise, Legrand Legacy: Tale of the Fatebounds starts off with promise as the story begins with your character, named Finn, serving as a captured slave being forced into a gladiator style fight in Tel Hartman. Tal Hartman, as quickly revealed, is the biggest city of slave owners in Targan. After defeating his opponent (which serves as a combat tutorial) through mysterious events but not killing him, Finn’s master is furious and is about to beat and almost assuredly kill him. This is when Greddo shows up and buys you from your now previous master. The story then quickly spirals with lengthy dialogue scenes and dropped, or poorly paced, plotlines that hurts the story overall. With that said, the developers stick close to the classic JRPG experience and places emphasis on the story, lore, and character development. This ends up making the story more of a mixed bag than it could have been with better pacing and shorter dialogue scenes.